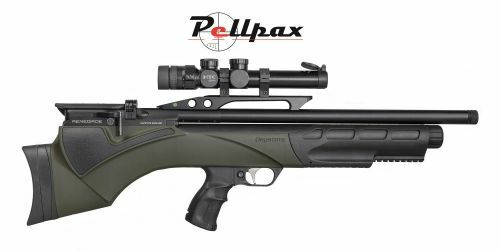 The Renegade is the latest release by Daystate Air rifles, one of the most prestigious names in PCP rifle manufacture. The Renegade is similar to the Pulsar in design but inside the synthetic stock it houses a mechanical action, this eliminates the historic problem with bullpup rifles, the long trigger pull and poor let off. The Renegade features a nylon synthetic stock which is robust, easy to grip and fantastically light for added manoeuvrability. The immaculate Walther Lothar barrel delivers exceptional accuracy for tack driving accuracy and flat trajectories.